“My husband used to spend a lot of time in the Chaco region. I wanted to work to help him, but my older daughter was still very young and I had to stay and look after her. We worked in several different sectors and spent six years investing in and growing rice with little profitability. One day I heard my mother-in-law talking about fish farming, and so as not to stay home alone, I went with her to a meeting of her association APNI (Association of Fish Farmers Integrated North), and there I heard the explanations by CEPAC technicians on fish culture and also what the other APNI members were talking about. I thought it was interesting, so I joined the Association. The fish farmers had difficulty selling their fish at the beginning. Then I opened up a restaurant (“Tambaquí Palace”), specializing in grilled fish, and we grew. We only bought fish for about a year and a half, until finally we were able to build four ponds to produce our own fish. Everything we sell is from our own production and from the Yapacaní fish farmers. We are fish farmers, not only because it generates an income, but also because it guarantees a supply of fish. I have been a fish farmer since 2011, and was president of APNI in 2012 and 2013. Because I belong to APNI, I received training from CEPAC. I was also trained in fish reproduction in CEPTA in Brazil, thanks to the Project Peces para la Vida Phase I (PPV I) and World Fisheries Trust. “I consider myself to be an enterprising woman. I’m always busy doing something. That is why I always dedicate myself to working in several occupations. I planted 400 hectares of rice here in Yapacaní and Beni, but the price went down too much that year and I went bankrupt. So I went to Spain to work for two years to be able to pay off some of the debt that was still owed for agrochemicals. When I returned from Spain, I wasn’t doing anything, and one day I heard on the radio that PPVII-CEPAC were giving courses on fish farming. As I had seen how sardines were raised in cages at sea, I had the idea of raising fish in cages in the river. I intended to fence off a part of the Choré River that runs through my property, but because of the use of agrochemicals in the area I wondered if that would be a good idea. So when I heard about the courses on fish farming I went to register. I was one of the first people to be involved in fish farming in this municipality. For me it was difficult, because the in first year, a cold snap killed half of my fish, which already weighed around 700 g. There was no way to heat the water and I had to seine all the fish because they were going to die. I bought a freezer and filled it with my fish and froze them. I wanted to sell them but the people didn’t know this species very well and they made fun of me. As they were small fish, they told me: “that can’t be pacu; that must be piranha!” ... and I couldn’t sell them. Finally, on Bolivia’s anniversary, I took my fish to the market and cooked them on the grill ... That’s how I sold fish! Whenever there were courses offered by PPVII-CEPAC or at other places, I enrolled. I attended courses on tilapia fish farming and fish processing. They taught us how to make meatballs, nuggets, burgers, etc. 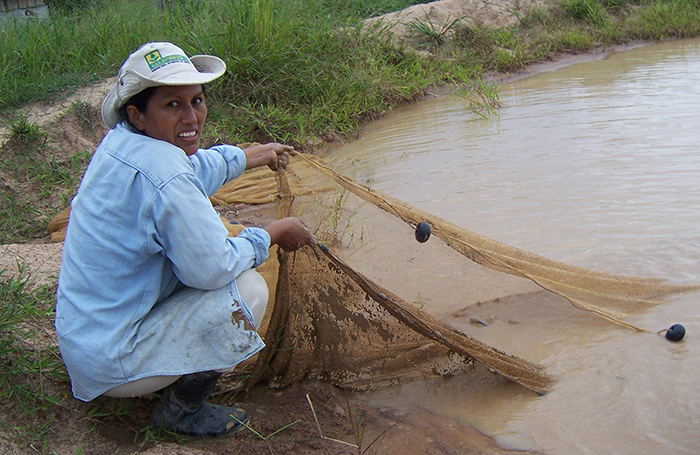 I am currently training as a Technical Assistant in fish farming with the Project Peces para la Vida II. I’ve participated in technical exchange visits to San Ignacio de Moxos, and in the creation of the new Fisheries and Aquaculture Law, here in Santa Cruz.